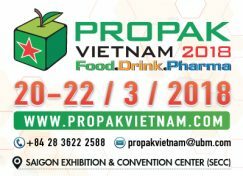 We will be exhibiting at THE 13TH INTERNATIONAL PROCESSING, PACKAGING EXHIBITION AND CONFERENCE FOR VIETNAM from 20-22 March, 2018 in HO CHI MINH CITY, VIETNAM. Please visit our booth to see our top quality industrial inkjet printers and high performance inks for porous and nonporous media. 799 Nguyen Van Linh, Tan Phu Ward, District 7. Ho Chi Minh City, Vietnam.